Our client was a European real estate company which specialized in the purchasing and selling of real estate properties. The client approached Outsource2india (O2I) with a drone video editing project for their marketing needs. 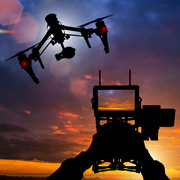 The client had footage of various properties that were captured by drones. They wanted O2I to edit the raw footage and produce an appealing video that could attract potential buyers. Outsource2india's prior experience in video editing, affordable pricing, and swift response encouraged the client to outsource their work to O2I. The client was working on a tight schedule and needed Outsource2india to deliver individual batches, containing 4 to 5 videos, every 24 hours. This proved to be a challenge as editing a video included various steps from removing unwanted footage to addition of texts and background music. Additionally, the client wanted O2I to use Final Cut Pro to edit their videos as well as specified certain font types to be used for the text present in the video. Once the project was approved by the client, O2I assigned two resources to work exclusively on this project for easy execution and fast turnaround. Keeping in mind the client's request, the team used Final Cut Pro to edit the videos. The team removed unwanted footage, stabilized the video, added music and text, etc. so as to ensure that they met the client's exact specifications. The Quality Assessment (QA) team at Outsource2india performed multiple quality checks to ensure that the project matched the client's expected quality and guidelines. Despite the challenges faced during the course of the project, the video editors at O2I were able to edit and deliver one batch of videos every 24 hours to the client, thereby clearing all backlogs that the client had. The edited videos met the client's expected quality benchmark with an accuracy level of more than 98%. Outsource2india's cost-effective and efficient video editing services helped the client to reduce their in-house cost by almost 50%. The client was highly satisfied with the quality of videos produced by O2I and outsourced 50 additional real estate videos for editing, leading to the establishment of a long-term relationship between the client and O2I. As a result, Outsource2india was able to secure a large billing client. If you are interested in learning more about drone video editing or general video editing services from the O2I team, contact us today. Send us your requirements and our customer engagement team will get in touch with you within 24 working hours.